It is with regret that we advise the membership of the passing of A. John Russell, who died peacefully Sunday morning January 14th 2018, following a decade long struggle with Alzheimer’s. Born in England in 1929 John graduated from the University of Liverpool with a B. Arch (Hons.) where he captained the rugby team. John immigrated to Canada in 1957 and, fortunately for us, he brought with him his three loves namely Architecture, Family and Rugby (in alphabetical order). Mirabel and John raised their family of five children in the Ottawa area. He began his sixty year association with rugby in Ottawa in 1957, when he joined Ottawa’s first rugby club, the Ottawa Beavers and helped his team win the Quebec League Championship. In 2001, the Beavers who were celebrating their Fiftieth Anniversary presented John with the, “Player of the Decade Award for the 1960’s”. In 1963 John continued to help grow the sport of rugby in Ottawa by becoming the founding President of the Ottawa Indians RFC. He remained a member of the Ottawa Indians RFC until 1972 when he again helped in the establishment of another new team The Bytown Blues RFC. John was the winner of our clubs first Player of the Year Award and the following year Robin, Mirabel and John’s son, was the second recipient of this award. John Russell demonstrated an unprecedented love of and dedication to the sport of rugby for over 60 years in the Ottawa area. This was shown not only in the playing aspects of the game but also as a builder and consummate volunteer and administrator within the sport. He was chairman of Eastern Ontario Rugby Unions Selection Committee during the period the Rep team enjoyed notable victories against sides such as Llanelli (Wales) and Bath (England). He was the first Secretary of the Twin Elm Board of Directors. In 1974, under John’s leadership, Twin Elm was granted one of the first Wintario Grants which enabled the construction of Twin Elm Rugby Park. He oversaw the building of the Twin Elm facility and grounds which opened in 1976 and John served as its President during its early years of operation. John, a valued executive with a well respected Ottawa builder, had consistently encouraged his employer to support rugby and for many years Twin Elm had been the beneficiary of a significant capital donation from The Minto Foundation. John and Mirabel toured with the Bytown Blues to both Africa and the Bahamas. They have graciously hosted innumerable touring sides poolside at their homes. 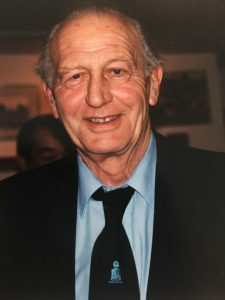 In 1980, John went on to serve for 10 years on the board of the Canadian Rugby Union and held the posts of Vice President and Chairman of Coaching. He stepped down from the CRU Board in 1990 and, was re-elected onto the Board of Twin Elm Rugby Park. In 1996 he was appointed as Twin Elm’s first and only Honorary Chairman of the Board. John was one of the original 6 Bytown Blues Life Members. In 2001, John was inducted into the Rugby Ontario Hall of Fame. This was followed in 2002 when he was inducted into Twin Elm Rugby Park’s Wall of Fame in an unprecedented three categories; namely Builder, Official and Player. John and Mirabel Russell’s contribution to rugby lives on in the next two generations. Of their 5 children, 4 have played Rugby and three have played at a representational level. Robin played for the University of BC, BC & Canada as number 8 and flanker and was a member of the Meraloma’s RFC in BC. Annie played for Quebec and was the first Captain of Rugby Ontario’s women’s team. The EORU Russell women’s league, is named for their daughter Helen in recognition for her contributions as Captain of Quebec, Ontario and Canada – she played for Canada at the first women’s world cup and was inducted into the Ontario Rugby Hall of Fame 5 years after her father`s induction. John, and these 3 children, are all players of the decade on the TERP Wall of Fame. Every member of the family is a Founder Member of TERP. The majority of John and Mirabel’s 13 grandchildren have played Rugby; including Russell the eldest grandson. Russell played for the Bytown Blues and the University of Western Ontario. He has also represented Canada at the Maccabi games in Israel in 2009, with his mother Ann acting as team manager. Russell’s father Jeff played as well for the Bytown Blues. John made a tremendous contribution to Ottawa Rugby and to the Bytown Blues. He will be sorely missed, but not forgotten.